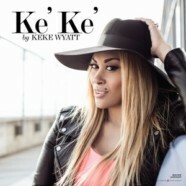 She has swarmed us with her ‘I don’t care what you think about me attitude’ on reality television show R&B Divas of Atlanta and now singer and Indianapolis native KeKe Wyatt is back with a new EP. Many fans, including myself, wondered when we would start to hear new music from Wyatt besides her constant collaborations with R&B singer Avant. The five tracks on this EP are just enough to give fans a taste of the talented singer’s vocals and skills as a writer in the music industry. Although Wyatt has had a tumultuous last few years, there’s no denying her talent and diversity. How many R&B vocalists can make a transition from gospel to pop and all the way to country? The talented songstress has lent her talents to many genres- rightfully so- as she has the vocals to prove her transparency as a singer. The EP opens with the lead single, “Fall In Love,” that adds an extra ‘grown up’ KeKe compared to what were used to listening to. Rapper Pusha T lends his 16 bars with song “Rain” to add the deep down south element to the EP. I’ve always been a sucker for a good love song, and Wyatt delivers with “Another Lifetime” in which the singer expresses her love for her husband and how she hopes to also be in love with him eternally. Ladies, we have all had that one relationship were we can’t seem to shake from our memory and song, “Remember” reminds us about just that. The final track, “Lie Under You,” is another good comfort song for lovebirds that have been through their ups and downs but still finds a way to be in love with one another. Although this is an EP that gives fan just enough, I still wish this were a full album. With a voice such as Wyatt’s, her talent succumbs her personal tragedies and drama filled life because her voice and music gives fans life. If you are looking for a few tracks to listen to but are still on the fence about Wyatt, give this EP a listen, as it will provide you with a sample of the true talent KeKe Wyatt truly is. True Wyatt fans will love this EP and naysayers will be surprised, wanting more from the songstress.